To extend my look into Pirbhai’s vocabularies of indenture I consider Khalil Torabully’s poetry, the generator of the Coolitude concept. It is through his conceptualization of Coolitude that the Mauritian poet establishes a discourse that empowers the Indian labor diaspora to begin to draw connections between themselves despite national identities. The foremost in articulating his concept of Coolitude are Cale d’étoiles-Coolitude (2002) and Chair Corail: Fragments Coolies (1999). The passages that I examine are written originally in French, for which Torabully and Carter offer English translations in the book Coolitude: An Anthology of the Indian Labour Diaspora. Even though the authors offer translations, I translate them from the French to make available to an Anglophone audience the vocabularies they attempted to obscure for reasons of poetic voice. An important particularity to consider when reading Indo-Mauritian work is that the islands were colonized by the French and not the British (they took control of Mauritius in 1810, accepting the French creolization that happened there with former African slaves, the indigenous of the islands, and eventually various South Asian ethnicities and the Chinese) who colonized Guyana and Fiji. This specificity lends import when reading the literary trajectories and confluences. The template of Senghor and Césaire’s negritude, créolisme, and indiennocéanisme have all contributed to the evolution of Coolitude in its orientation and intellectual genealogy. Torabully acknowledges the changing of South Asian culture given the interactions with people of other ethnicities and national belongings. By doing so Torabully refuses an ethnonationalism that relies on a category that is not economic in origin. The coolie is a category created by the economic conditions of being transported for labor. The word coolie comes from Tamil, meaning laborer. Already, Torabully opens his subjectivity to the change that diaspora brings. Is my true harvest of dreams. Torabully turns the noun coolie into a verb: to coolie; a process that language does to them. The speaker is coolied by language. By making this noun into a verb, Torabully coolies language himself by using the vocabularies of indenture to illustrate grammatically the potentiality of coolitude in diaspora. To turn the word coolie into a verb gives it a certain animacy, a kinetic motion that shows that coolies are made by their vocabularies. Here the poet also alludes to the sea — a motion toward kalapani which inevitably foreshadows a cultural shift. Without using the word specifically, the poet is able to shade his line with the coolie imaginary. In the poet’s own translation of the line “Cast modeled stalled,” he uses the words “Pappadumbed, curried away, coiled,” which reflect a different kind of wordplay occurring. The French version and the English version presented in this book are entirely different poems. In the poet’s English version the use of “pappadumb” and “curried” as verbs that reflect motion is another way that the poet lends velocity of the verb to the noun. These are both South Asian food items that Torabully transforms into verbs of motion. Pirbhai, M. (2009). Mythologies of migration, vocabularies of indenture : Novels of the South Asian diaspora in Africa, the Caribbean, and Asia-Pacific. Torabully, K. (2015). 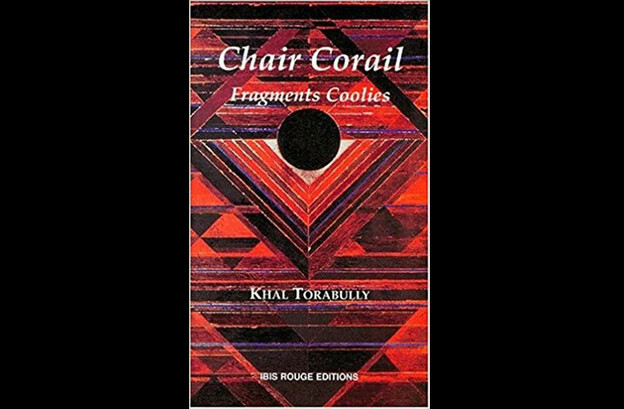 Chair Corail Fragments Coolies. Matoury: Ibis Rouge Éditions. Younger, Paul, and Younger, P. (2009). New Homelands: Hindu Communities in Mauritius, Guyana, Trinidad, South Africa, Fiji, and East Africa. Oxford University Press.